My grandson, Liam, is quite the baseball player, even at five years of age. He swings and swings at the t-ball and though frustrated when he misses, soon enough he gets a powerful hit. Boom! 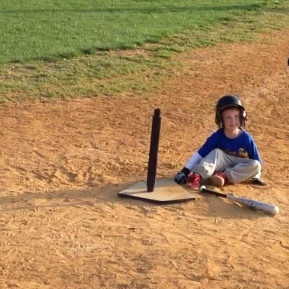 Making the bases one by one, you can see his enthusiasm to get home. With third base fading behind him, he slides into home plate in a cloud of dust, no matter how fast he was actually running! Baseball players slide, he tells me. Got it. Another baseball player was having a terrible day. He had already struck out twice and now two runners were left on base. His team was losing 3 to 1 in the eighth inning. The baseball fans were booing him in unison as he came up to bat again. They wanted him to strike out again! The batter swung and missed the first fast ball. The second pitch was good too, but he swung so hard that he spun to the ground in a cloud of dust. Strike two. The crowd roared. The pitcher threw the third ball over the plate so fast that many didn’t even see it. But all heard the crack of the bat as the ball went soaring out over the scoreboard-one of the longest hits ever made in baseball history. As the batter trotted around the bases sending in the runs that would win the game, the crowd gave him a wild ovation… the same crowd which had booed him moments before. The batter just smiled as he crossed home plate. The year was 1927. The place, Shibe Park, Philadelphia. You have heard of the batter, Babe Ruth. 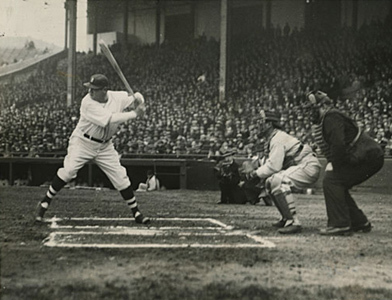 Babe Ruth hit 851 home runs, but he struck out 1,330 times! The point is that we don’t think about his failures, and neither did he. He just kept on swinging. Like Babe Ruth, we frequently hear a nasty crowd jeer us, not cheer us. We feel the pressure. We see the scoreboard. We swing hard at our goals. We strike out often and disappoint ourselves. But if the goals we pursue are worthwhile, then its worth our while to keep on pursuing them. The only ones who score are the ones who swing. Remember the 851 home runs of Babe Ruth. Take time for living and keep on swinging. Listen for the sound of your bat as it cracks with power. And if you need any inspiration, just ask Liam. You can learn a lot from a five-year old. Trust me.